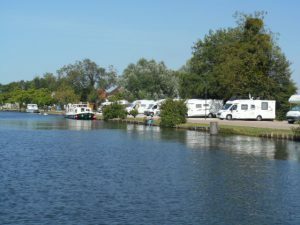 Home > Blog > Where can I service my campervan’s fresh and waste water in France? Where can I service my campervan’s fresh and waste water in France? Many of our first-time hirers ask where they can empty waste water and fill up with fresh water while travelling in France. The simple answer is, there are lots of options here. In France, there’s a good network of “Aires de Services Camping-Cars” (campervan servicing points). 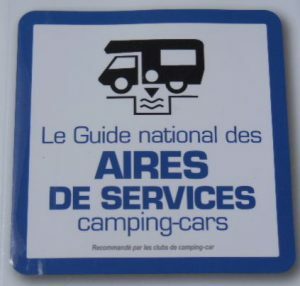 Not to be confused with regular “Aires de Services” (service stations on motorways), “Aires de Services Camping-Cars” or simply “Aires“, as they are generally referred to, can be found all over France and provide facilities to empty your grey water tank and chemical toilet, and fill up with fresh water. Lots of campsites offer these facilities too, so if you stay on a campsite make sure you take advantage of the facilities before you leave (especially if they are included in your campsite fees). If you are avoiding campsites though, you’ll need to find an Aire de Services Camping-Cars. All France Motorhome Hire vehicles come with a “Guide to the Aires of France” (over 3,000 are listed). You can also look out for signposts with the motorhome symbol which denotes an “Aire” (just like the one shown on the photo above), often guiding you in from the edges of towns and villages. If you are planning ahead, the AireCampingCar.com website provides a fairly comprehensive listing and map too. Expect to pay between one and four euros to use the facilities (although some are free) and don’t be surprised if you have to visit the local bar or boulangerie to buy a jeton (French for a coin-like token) to operate them. You can also sometimes buy mains power (again with either a token or coins) in an aire and at many you can stay free or very inexpensively overnight too. Aires range in size greatly; some have just a handful of spaces while others can accommodate hundreds of campervans at once. They also vary in desirability too, from picturesque spots overlooking rivers (like the one above in Gurgy) to sites in the ugliest and most industrial area of the town. You never know what it is going to be like until you arrive, so be prepared to service your vehicle and move on if it looks like an undesirable place to spend the night. Motorhome travel in France is so well catered for it really is the easiest country in the world to give it a go!